With the college football playoffs right around the corner, fans know that each Saturday is more sacred than the last. While divided by their dedication to the SEC, ACC, Big 10, Big 12 or Pac-12, one thing all college football devotees have in common: school spirit. 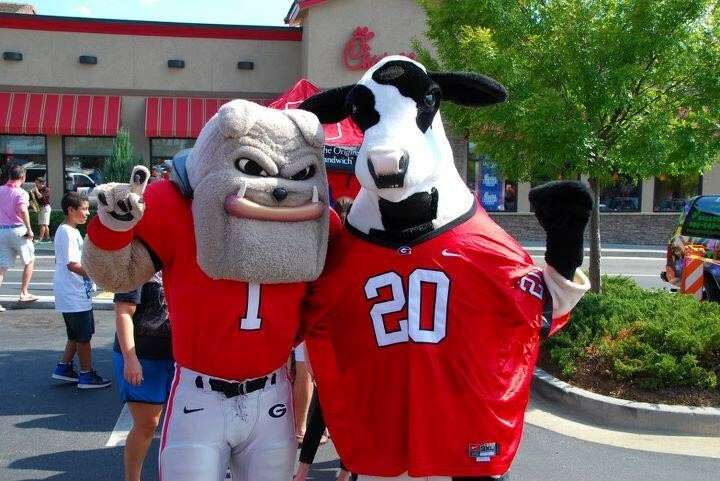 With less than five weeks to the Chick-fil-A Peach Bowl, home of the 2016 College Football Playoff Semifinal, school spirit is at an all-time high at Chick-fil-A too. Take a look at how a few of our college-town restaurants show their love of the game. University of Georgia: Athens, Ga. The University of Georgia (UGA), nestled in the quintessential college town of Athens, Ga., otherwise known as the “Classic City,” prides itself on being the oldest state-chartered public university in the country. (Of course, University of North Carolina at Chapel Hill begs to differ.) Home of the Georgia Bulldogs, the UGA campus fills with tens of thousands of fans hours before each home game. But one of the biggest parties is in an unlikely place that trades the pigskin for chicken: the nearby Chick-fil-A at Beechwood. Game days at the restaurant start early. Really early. Around 2:30 a.m., employees dressed in UGA gear start pumping UGA Redcoat Marching Band music through the restaurant speakers as they hand-prepare food to feed much of the Bulldog faithful – namely 450 members of the marching band, the cheerleading squad, thousands of fans and even the football team. “Since the games are played just a couple miles from our restaurant, we want to be part of the culture of UGA football,” says Todd, who even commissioned a special painting by Atlanta native — and now world-renowned artist — Steve Penley. The painter’s portfolio includes works for Coca-Cola and several U.S. Presidents, but the UGA mural extending throughout the restaurant is just as unique. The giant painting features iconic players and coaches from the university’s storied football program, from Heisman Trophy winner Herschel Walker to National Championship Coach Vince Dooley. As a UGA graduate himself, game days in Athens aren’t just about business for Todd – they’re a matter of pride for the town he calls home. University of Southern California: Los Angeles, Calif. 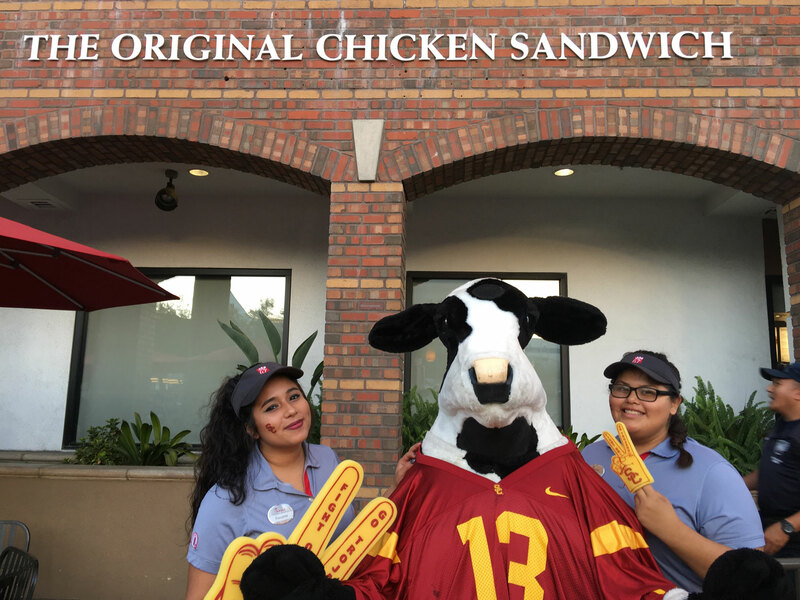 Team spirit at the Chick-fil-A of University of Southern California (USC) extends beyond the restaurant. The restaurant sponsors each pre-game show at Los Angeles Memorial Coliseum with free sandwiches, games and cheers. Inside the restaurant, “I want to share our Trojan pride and make sure my team has fun,” says Ashley Lamothe, the restaurant’s franchise owner. 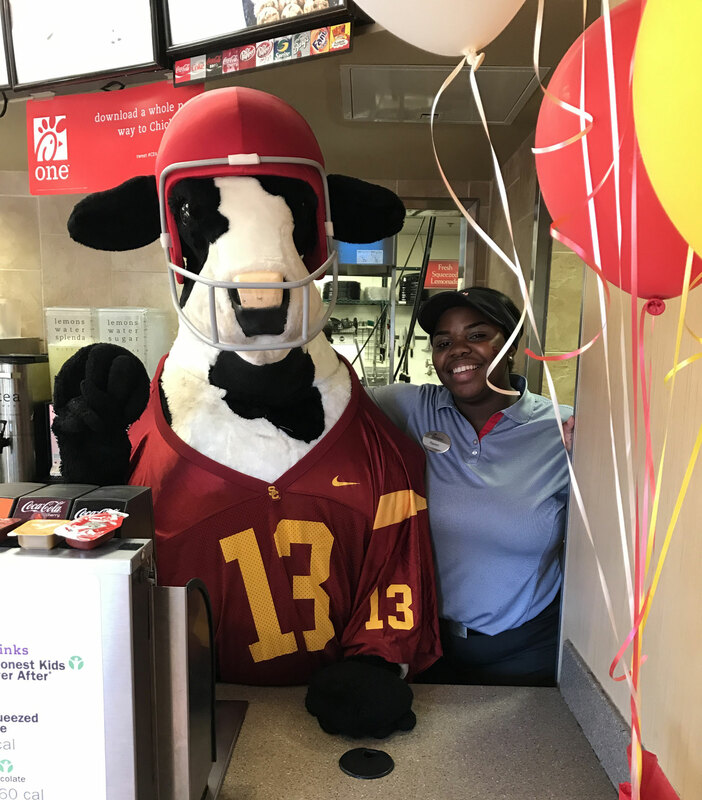 To do that, Lamothe and her team decorate the restaurant in USC colors and balloon arches, give away Chick-fil-A footballs and even raffle football tickets. 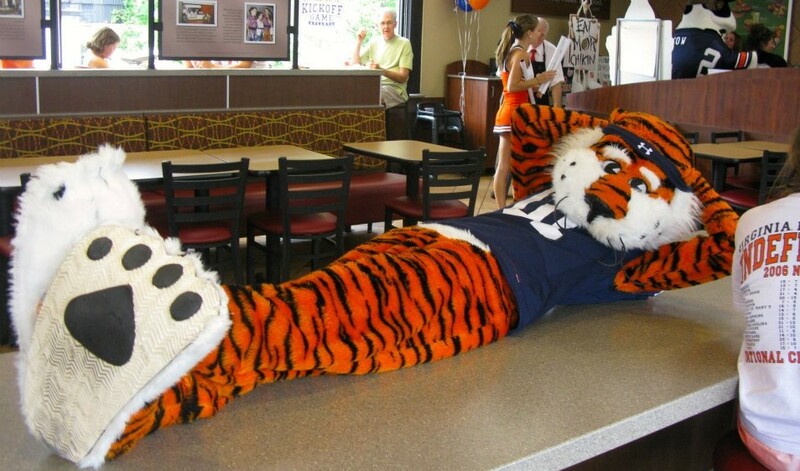 There’s a magical place just down the street from Jordan-Hare Stadium in Auburn, Ala., where cows and tigers join forces, and it’s not Narnia – it’s the Chick-fil-A at Magnolia Avenue. 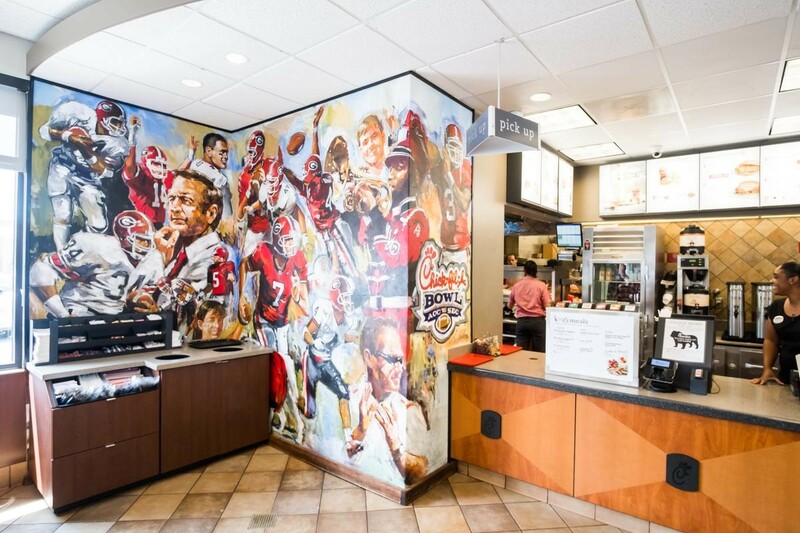 This tricked-out Chick-fil-A goes from a normal restaurant by week to a raucous Tiger gathering each Auburn football home game. To show their Tiger pride, team members decorate the restaurant with orange and blue balloons and school posters. 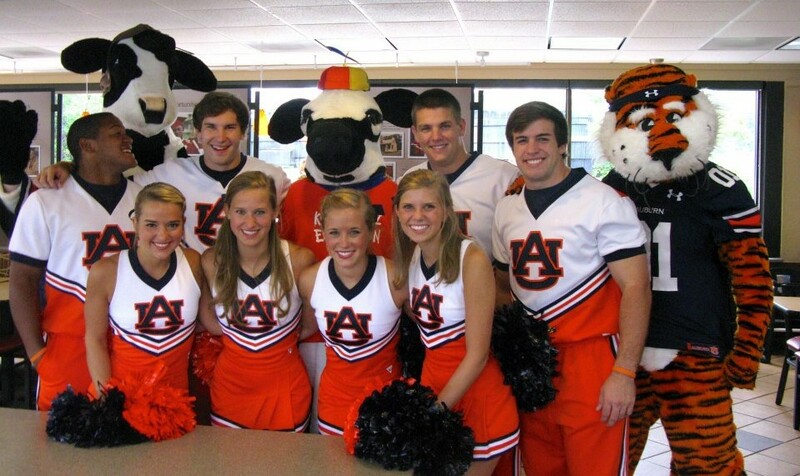 When things get really rowdy, they’ve even been known lead restaurant customers in Auburn cheers (“War Eagle!”). And sometimes, the party can go well past dark. Some 230 miles northeast of Auburn University is another university with a passionate fan base of Tigers supporters – Clemson University. Conference champions in 2015, Clemson knows football, and the Tigers celebrate it in style. 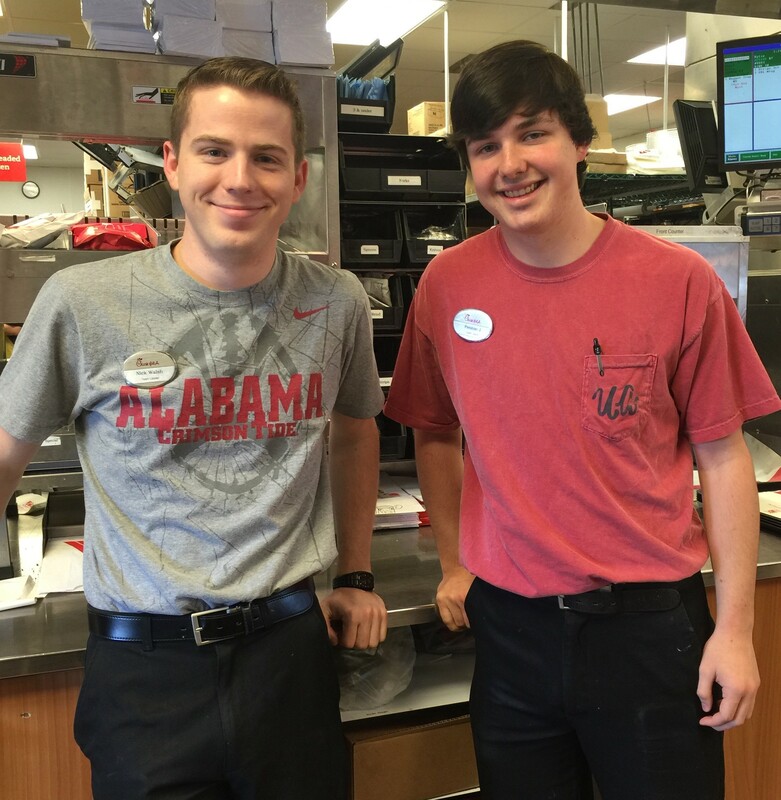 At one Chick-fil-A on campus, students make up most of the staff, and they show their pride the best way they know how: with food. To ramp up the excitement for the 2015 national championship, the Chick-fil-A restaurant started a new tradition by hand-rolling and serving chicken biscuits in the shape of a tiger paw, paying homage their mascot. 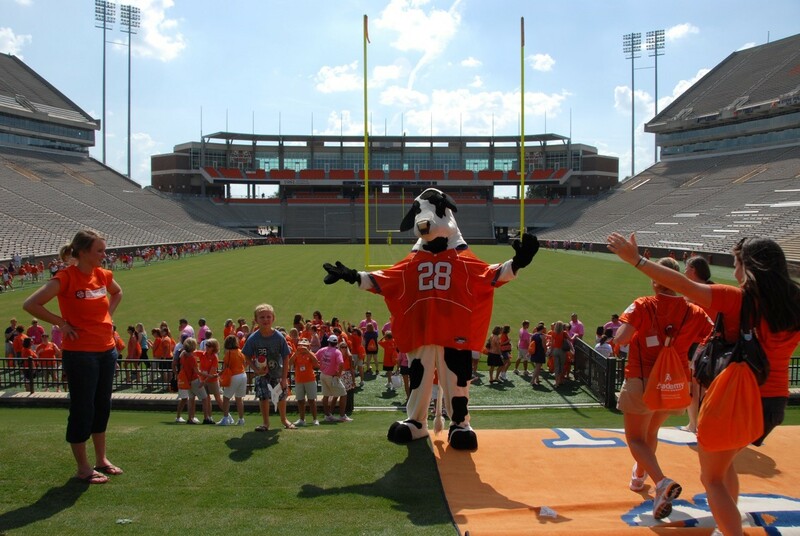 Much to the surprise of Chick-fil-A at Clemson Franchise Owner Herb Tyler, the biscuits not only had local appeal with the fans, but television and media around the country spread the story of the Tiger paw biscuits. The biscuits were so well received in 2015 that Tyler and his team have been making them every Friday before home games this season. “People all over the country were calling me wanting these,” says Tyler. University of Alabama: Tuscaloosa, Ala.
Perhaps no other college football team has dominated the sport more in the past decade than the Alabama Crimson Tide. With four national championship titles since 2009, fans have had plenty to cheer about. But when the Tide rolls out of Bryant-Denny Stadium, they roll right into the Chick-fil-A at Tuscaloosa South. 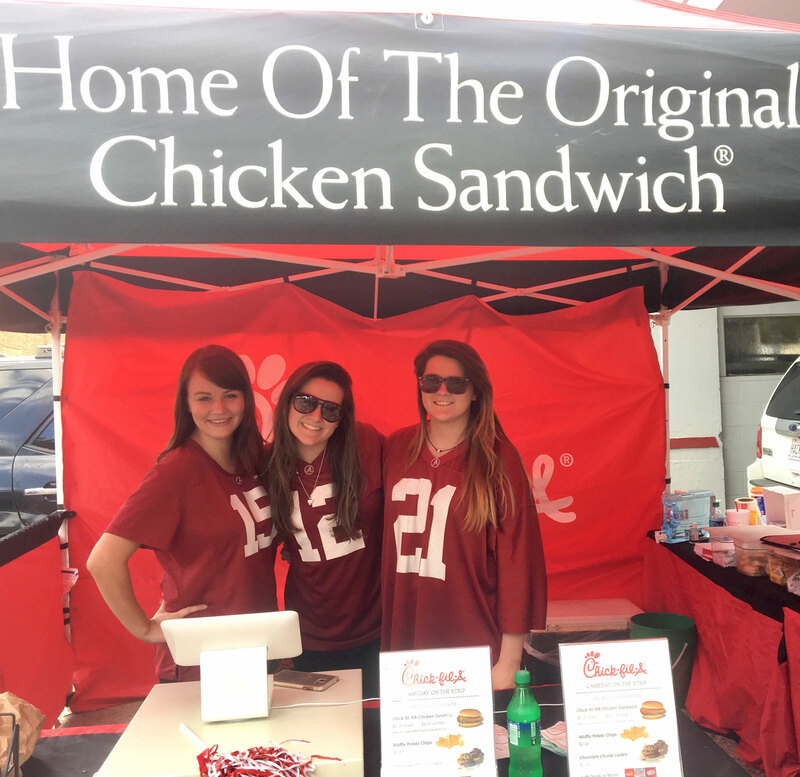 “Alabama football is more than just a Saturday activity; it’s ingrained in the culture,” says William Boulware, franchise owner of the Chick-fil-A at Tuscaloosa South. Fans and employees alike dress to impress for every home game at the restaurant, sporting the now-famous Crimson Tide red and houndstooth patterns. Restaurant employees also set up a pop-up Chick-fil-A restaurant on campus to feed the fans and cheer on the team. For Boulware and his crimson team, game days at the restaurant are more than just a tradition – they’re a way to connect with the town they love. “It's our way of joining the community to cheer on the Crimson Tide,” says Boulware.